Pin Hole Detector, in-line PinHole Seal Leak Inspection System. Nissin Pinhole Detector, Model: NPC-501 can effectively detect pinholes or inferior seals in products packed in pouches, tubes, sealed plastic containers, or wrapped in laminated film. High Speed Inspection of individual packages is executed in-line, in a non-destructive manner. 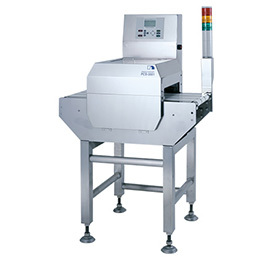 Nissin Pinhole Detector, can prevent the decomposition, or degradation of the product quality that is likely to happen if products with undetected pinholes enter the distribution process. Nissin Pinhole Detector, is employing "Rapid Scan", a high voltage sensor, delivering fast reliable performance. The Nissin Pinhole Detector, detects the presence of pin holes by applying a high voltage field to the surface of the inspected product. The presence of a pin hole, will reduce dielectric barrier created by the inspected product's packaging material. This will result in an increase of the current flow in the Rapid Scan sensor circuits. When the increase of the micro current flow will pass the early determined triggering point for the particular product, the detection alarm is set. During inspection of packages without any pinholes, "residual" current flow will always be below alarm triggering level. 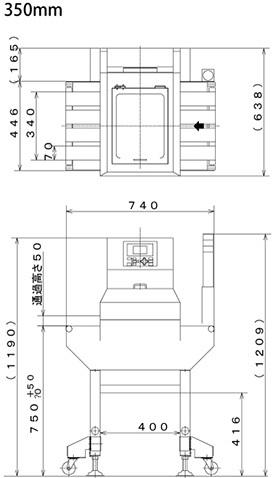 The important point of the performance of Nissin Pinhole Detector is the unique design of the Rapid Scan high voltage sensor, and the specific materials used. • Nissin Rapid Scan high voltage sensor is offering safe and reliable performance. This is partially contributed to the use of electrodes made from Amourfas metal fiber. The Amourfas metal fiber is flexible highly stable material. This unique design allows for excellent contact between the Rapid Scan sensor electrodes and the inspected product. This proprietary Nissin design allows for significant reduction of voltage level in the Rapid Scan sensor circuit. • In order to achieve high penetration of the inspected product surface Nissin Rapid Scan sensor is equipped with multiple electrodes. 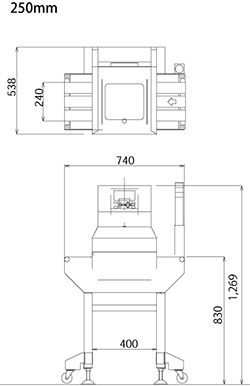 This proprietary Nissin design allows for a multi stage scanning process resulting in detailed penetration of the package surface, and excellent reliability of the scanning process. • In the case of a product with a package surface which is difficult to penetrate by static electrodes, Nissin is employing specially designed rotary electrodes. This Nissin proprietary design delivers excellent penetration of the most difficult surfaces. • Nissin Pinhole Detector allows to memorize set-up for up-to 99 products. Those set ups can be easy recall by the operator during changes of product on the production line. 1. The inspected packages should be packed in non-conductive material. • Conductive materials such as aluminum foil, or aluminum evaporatied film are creating potential problems. If your product is using such packaging material please contact us to discuss such application. The surface of package should by dry before inspection. We are pleased to evaluate the suitability of your product for inspection using the Pinhole Detector. We will require a few samples for a detailed test. Please contact us to discuss details. This specifications are just for a standard model. The specification will be changed in other model. Retort foods such as curry, rice and sauce.